…Many of us who saw and experienced the sufferings and pains of Biafra and its aftermath would not wish for another civil war in Nigeria. Nobody will wish to relive some of the experiences…at several points in our national History, the foundations of Nigeria's unity have been tested. The "Kaiama Declaration" and the Niger Delta struggle with its militancy threatened our unity. After the 2011 elections, the post-election crisis which exacerbated the Boko-Haram insurgency has severely threatened the national unity…the lessons from the Nigeria civil war seem to have helped us to steer clear of another war. I therefore believe that the Nigeria-Biafra war, was a war for Nigeria's unity. …In concluding this story of my recollections of what happened during the Nigerian civil war from the perspective of a young combatant, let me draw out a few lessons and make a few suggestions that in my opinion will not only help to avert another civil war but will help consolidate our unity. Thirdly, and consequent on the above, we must practise true federalism in all of its ramifications. The centralization of authority and command introduced by the military has been a major cause of destabilization. The struggle to control the federal government is the major recurring irritant to National unity. Power should be devolved to the federating units so that we can make the centre less attractive and the struggle for it less acrimonious. Fourthly, we should introduce a single National Language outside English. It could be the Wazobia language that was being developed some time ago or one of the current popular Nigerian Languages. Every Country around us has their indigenous national language outside that imposed by the colonial government…Nothing unites a people more than a common language. Fifthly, this current practice of rotation of public offices must be continued until every zone has held the topmost office in the land and then it can be jettisoned for an arrangement that compels alliances so that no single zone can dominate or go it all alone. Sixthly, the Country must institute a reward system that rewards Hardwork and merit. The subsisting system that seems to promote privileges for the well-connected and where reward seems to be inversely related to effort or sacrifice will not promote National unity. Seventhly, we must enthrone a nation where the rule of law reigns supreme, with no malice or favour to any one and where Justice does not go to the highest bidder. There are many more things that can promote national unity, some of which I had previously discussed in my earlier book: NIGERIA: NEED FOR THE EVOLUTION OF A NEW NATION…We must ensure that Nigeria does not fight another civil war nor promote any new regional insurgency, militancy or rebellion. With determination and sincerity of purpose under God, this is attainable. We have had enough. 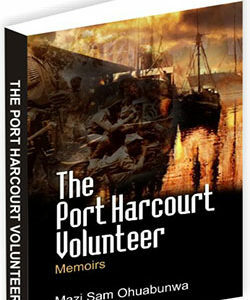 This article is an excerpt from the book, THE PORT HARCOURT VOLUNTEER: Experience of a Young Combatant in the Nigeria-Biafra War. Click on the title to place your order.